How To Survive The Holiday Crazies! Lately I've noticed that my shoulders are literally up in my ears! The stress and tension of caring for a big family, mixed in with some health scares from someone I love deeply, is enough to make me clench my jaw 24/7 but then add into it the holidays and it's so easy to feel overwhelmed! So, I took a little of my own advice and made myself a self care list of things I plan on working into my daily schedule. It starts with a quiet moment in the morning and my journal. I write down my Intention for the season. It goes something like this: I am present in the moment of every day and choose to be surprised by joy. I notice all the special moments without rushing to get through my never ending to-do list and I am ok if it doesn't all get done. I remind myself to breathe deeply! Even the simple task of writing in my journal ten minutes in the morning makes me feel more grounded and ready to experience each day. Carving out a little extra time to do some morning yoga then have a warm cup of tea with lemon is worth waking up the extra 20 minutes. When the days get tough I just remind myself to breathe deeply. Squeezing in a walk in nature and a good nights sleep also does wonders! I've illustrated a few other ideas here too. May your holidays be full of love and blessed with beautiful moments and may we all be able to drop our shoulders and enjoy every moment! How To Create A Personal Sanctuary Spot & So Much More! The new Living Lavishly magazine is here! I’m so impressed with how this magazine has grown over the past couple of years. I still remember the conversation over coffee with the publisher on how our town was in need of a fun shelter magazine. The next thing I knew Living Lavishly was born. It’s been a pleasure to write and illustrate for the magazine on what I love, DESIGN! Pick one up today or read it on-line here! Get The Look From Studio Ten 25! I just had to repost this Gorgeous Mood Board that the incredibly talented Abbe Fenimore (OMG! Watch the video!) put together on her blog today. The colors are so fresh and inviting, I seriously want to "Get The Look" for my own home and I was even more thrilled to see our Ballet TuTu Art Print included! A designer once said to me, “You should always have one piece of Asian furniture in your home.” I never asked her exactly why but I can imagine it’s to show that you are worldly? I thought it was kind of funny actually because I don’t think you should have anything in your home that you don’t find to be useful or that you absolutely love. I happen to love anything chinoiserie so I suppose I would have this designers approval, not that I would even care. 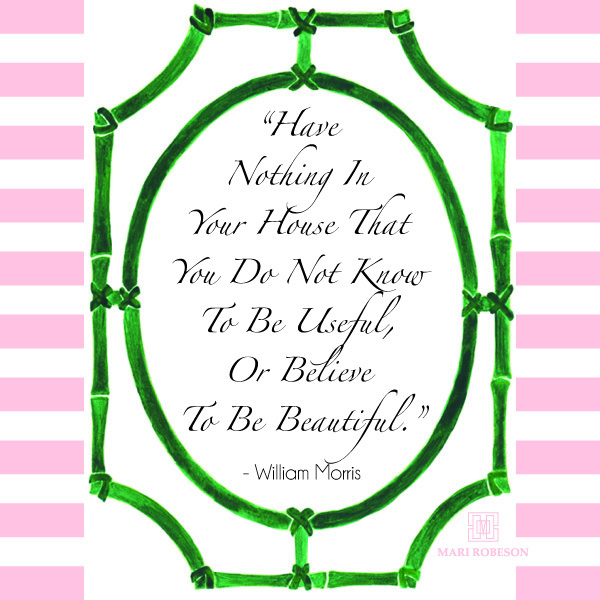 Decorate your home with what you Love! In honor of the fantastic designer Parker Kennedy and his Bamboo Fridays, this one is for you! Happy Friday y'all! Decor Amour For The Pink Pagoda! I adore the wonderful people I have met here on the www! Jennifer from The Pink Pagoda is incredibly talented and truly a wonderful human being. I love collaborating with her and our creative brain storming together! It's really wonderful when people can connect on a creative level and working with her has been exceptional. 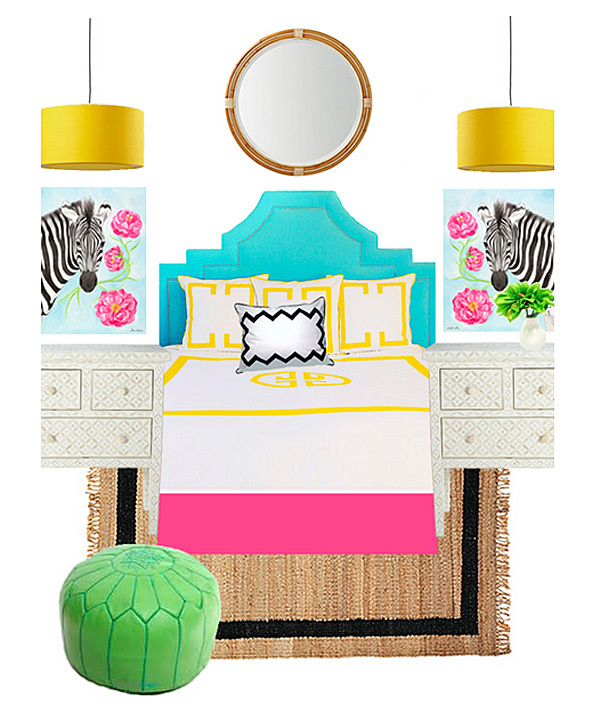 I was just thrilled when I saw this Mood Board she created with "Beatrice" the Zebra. It is so colorful and whimsical! If this is for a little girl then I want to be 10 again! :-) You can get all the details on her blog. Things Are Getting A Little Wild Around Here! I love a little animal print! “Little” being the important word here. Animal prints can be very bold so think about just using one type of print and selectively placing it in an area of impact. In other words, be conservative. I also love animals so please only use the faux versions. I adore the look of a fabulous faux zebra rug angled on the floor. It makes me think this person must be well traveled or at least they are quite adventurous, but I really don’t want it to be a real skin. That just makes me sad. You can easily create the story of the well traveled person without harming anyone! Do not even get me started on elephant tusks! Those only belong to the elephant! Some places you might consider adding a little “Roar” would be on the seat of a chair, an accent pillow, a rug, or a throw blanket. If you want to add animal print wallpaper, you may want to consider using it on an accent wall or on the back-side of a book case. Just a splash of animal reads sophisticated. Animal prints on all four walls would feel like a safari gift shop. If you’re just not that person who can see yourself living with a wall covered in zebra stripes, it may suite you better to hang a painting of a zebra but I’m personally a fan of a little animal pattern play in a room. It fits my personality. It’s a design motif you can easily try without a whole lot of commitment or you can just get yourself a fabulous kitty cat, that will do the trick too! Yesterday I was picking up prints of "Beatrice" to ship out & my wonderfully talented printer included this small 6" x 8" proof! It was such a lovely surprise! Thank you Les at Palette Arts! You are the B-E-S-T! Beatrice is exclusively available at The Pink Pagoda! Happy Hump Day y'all! Thank You Chinoiserie Chic For The Lovely Feature! I literally LOVE to see how people style my paintings and my textiles! I almost fell off my chair when I saw how Beth from Chinoiserie Chic put together this beautiful design board on her Fablulous Friday Finds blog post! It is simply stunning & I think I need to have that ceramic zebra in my life! Thank you so much Beth! Make sure you check out her gorgeous blog & while you're at it, head over to The Pink Pagoda where you can purchase Beatrice The Zebra! 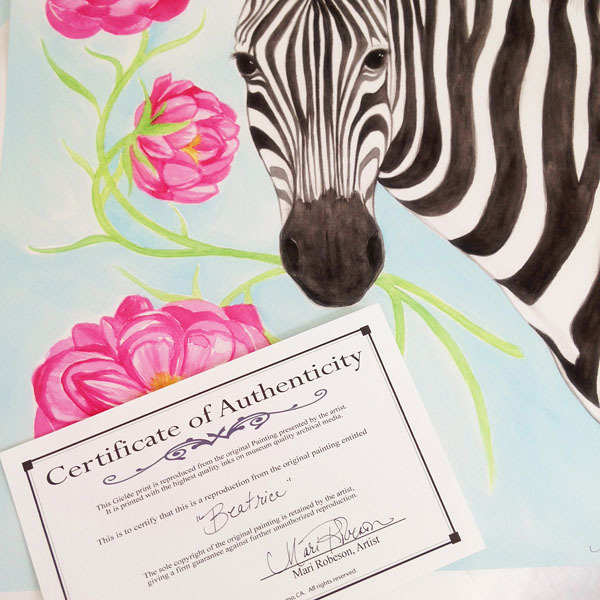 A special thank you and shout out to Jennifer as well because it was her vision of a whimsical zebra that inspired my painting....AND if it wasn't for the wonderful Linda of Calling It Home we would have never met. It was her One Room Challege that brought us together, so a huge Thank You to you too Linda! Wow! So much goodness & it's Friday! I think it's time to call it quits and have a celebratory glass of champs! New! Exclusively For The Pink Pagoda! I'm not sure why this is, but the Nicest People live in Texas! Over the past few years I have had the pleasure to collaborate with some of the most talented designers in that state. Jennifer from The Pink Pagoda is no exception! I was thrilled when we connected on Instagram. I admire her beautiful blog and sense of design, in her own artwork as well as her interior design. When she reached out to me with a few ideas I was honestly quite flattered and excited to work with her! She discribed to me her vision of porcelean elephants with her blue & white pottery on top and whimsical flowers...in pink, of course! This is what I came up with. You can now purchase the 16" x 20" prints exclusively in her shop, which is Loaded with other gorgeous treasures that you must check out! We also played around with the idea of a zebra and pink flowers. The first go around I came up with "Juliette" (seen on my previous post & now available in my shop) and now you can meet her Shakesperian sister "Beatrice" in The Pink Pagoda's Shop! I know, I know....crickets over here! June has been incredibly busy! I've been quietly working away on multiple projects and look forward to sharing with you soon! 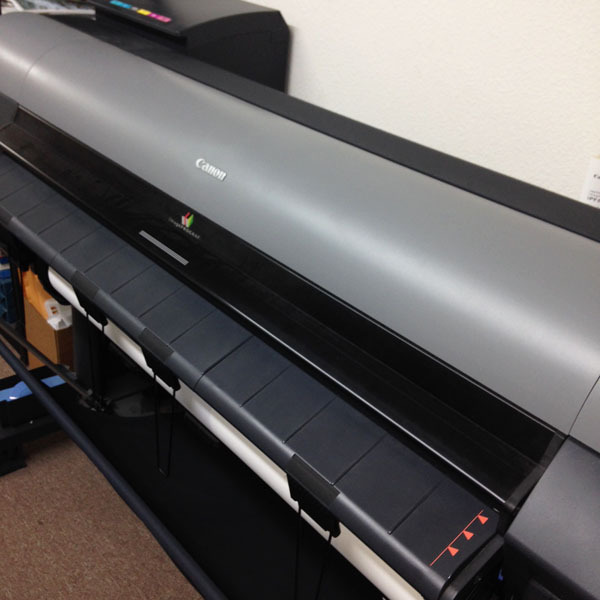 One of the projects I'm most excited about is a book I'm writing and illustrating! I hope to be among these greats one day! Also on the horizon is a very fun collaboration with The Pink Pagoda! I'll be sharing more about that next week! I you are enjoying a fantastic summer and working on projects that bring you joy!!! My word for 2014 is "Collaboration" and this year I have worked with so many wonderful shops, designers & bloggers. I love it and realized this is something I would most certainly like to continue to do. My latest project is with the lovely Jennifer, from The Pink Pagoda. Here's a sneak peek of my new watercolors that will be available exclusively on her site! More details to come soon! If you're interested in having your own exclusive art created for your shopping site or clients, shoot me an email!! One Room Challenge - Week 6 The Final Reveal - Studio Make Over! Today's the day! The Big Reveal...ok sort-of-big Reveal. After looking through all the amazing design blogs I was so impressed with the level of accomplishments my fellow bloggers achieved with their make-overs! Since the entire process of the One Room Challenge was all new to me, I started with a room that just needed a little sprucing up, My Studio, which is up there, in my attic. My husband & I designed and built our house ten years ago and I've always loved the attic space as my studio but it's funky because...it's an attic! I have to thank Linda of Calling It Home for putting this challenge together because it was huge motivation to go through and clear the clutter, not only in my studio, but in my entire house! The other really wonderful aspect of the challenge that I enjoyed more than anything was meeting so many incredibly talented designers. The banter over Gold Spray Paint on Instagram with so many of you especially, Emilie of Shell And Chinoiserie, kept my laughing through this entire process. Make sure you check out her reveal. We both purchased the same desk but she seriously glammed it up with some Gold Legs! Just fantastic! So here we go. It all started with this cat. When cleaning out my studio I found all kinds of things that I had forgotten about long ago. When I found my daughters cat (she's now 15) it brought back a flood of happy memories, so outside to the tarp she went where she received a shiny new coat of Gold along with cabinet knobs (still haven't found ones that I REALLY Love so these will do for now), my card racks, mason jars & a gold vase. I was pretty happy with all the items I painted gold...so fast...and easy...such instant gratification, one might even dare to say addicting! Then came the "Heart of Gold" gallery wall. Painting it took a while because I used a brush when actually the best way to paint anything metalic is to spray it on. Then came hanging the pictures. I made a template but I will tell you that hanging picture frames level and straight was no simple task! THEN, back in Week 2 when I was being soooooo organized, I had forgotten that I filed all the paintings I wanted to hang on the wall. Of course I found all of them neatly stashed away, AFTER I had hung all the others. Good Grief! So down some of them came and I switched them out to this final design. Onto the Rug. My attic can be super chilly or super hot sometimes. Luckily I'm in California so the weather is usually very nice but when it get's cold a fuzzy rug warms everything up! I shopped for a couple of weeks to find one I liked but there was always some issue. I actually had this one in storage which, guess what?, I found when I was cleaning out the rest of my house! I'm telling you Spring Cleaning is a great idea in more ways than one!! I love having my pillows and poufs all around me & Willow Loves it too! 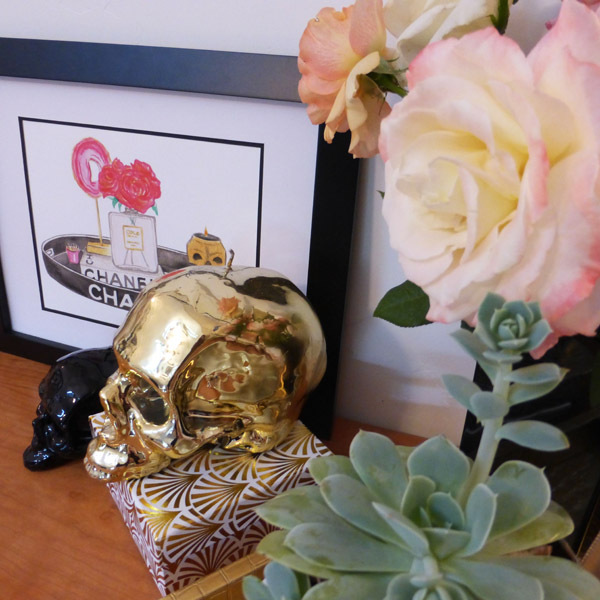 Really the only thing I purchased for this make-over was some gold paint, frames & the desk (which I love!) It was more about setting aside the time to make the space feel good to me which was really fun! Fresh flowers are a must for me in every room. These are from my garden. Sometimes it's a race between me and the deer to see who gets them! I meet with clients in my studio, so I have a stocked mini-fridge at all times. 6 Weeks of One Room Challenge complete. I do believe that calls for some Champs! Cheers! Make sure you check out all the One Room Challenge make-overs! You will be incredibly inspired! Thank you again Calling It Home! See you in October! Week 5 of The One Room Challenge involved painting my Heart Of Gold for my gallery wall, sourcing a rug (that's a funny story - I'll share tomorrow!) and shopping for desk accessories. I realized when shopping that I was, just a tad, over my budget but just LOVED these items I found. This is my Decor <3 Amour; Desk Accessories I Love & am kind of obsessed with!!! Some things that are a must for me on my desk are Always fresh flowers, good lighting (I'm obsessed with this lamp!!!! ), & a pretty note pad to jot down thoughts on a whim. I keep seeing this Day Designer organizer by Whiney English. Does anyone have it? Would you recommend? It's just lovely to look at so I can only imagine it must be wonderful inside too! I'm also just in LOVE with everything from Times Two Design & this acrylic business card holder is no exception, it's even PINK People!!! Love, Love, Love! Having that on my desk would make me happy everyday! Of course having a donut on my desk would make me happy too but that wouldn't be very healthy. I do however, Love my coffee! Roar! And who says function can't be pretty too? A-Dorable Bow paperclips, erasers & clock are all from Kate Spade, who else? That's pretty much my list of items I would Amour to have on my desk! Huge celebration dinner party tonight for my Daughter's Team winning State Cup...of course it's at my house! I may be a little late but I will post my One Room Challenges for Week 5 tomorrow!